DRIVEN TO RAGE AVAILABLE! | Carol Sheldon writes books exploring times-past through mystery, love, betrayal and murder. ← My BOOK LAUNCH PARTY! GOOD NEWS FOR DRIVEN TO RAGE! Finally, after a plethora of technical difficulties with my template, my book is up and available for purchase! Yea! I am very excited about this. If you’re in the Bay Area, the Left Coast Writers are launching a book party for me in San Francisco at Book Passage in the Ferry Building. The event is Monday, July 8th at 6:00. I’d love to have your company. There will be edibles and wine too! This book has been a dedication to all those who fought for the rights of labor. That is the background for this story that follows a family with divided loyalties, turns husband against wife, brother against brother. It is full of mystery, heartache, joy, love and murder. Please go down the shafts with the miners and further explore! Ps. I changed the cover. I hope you like it. 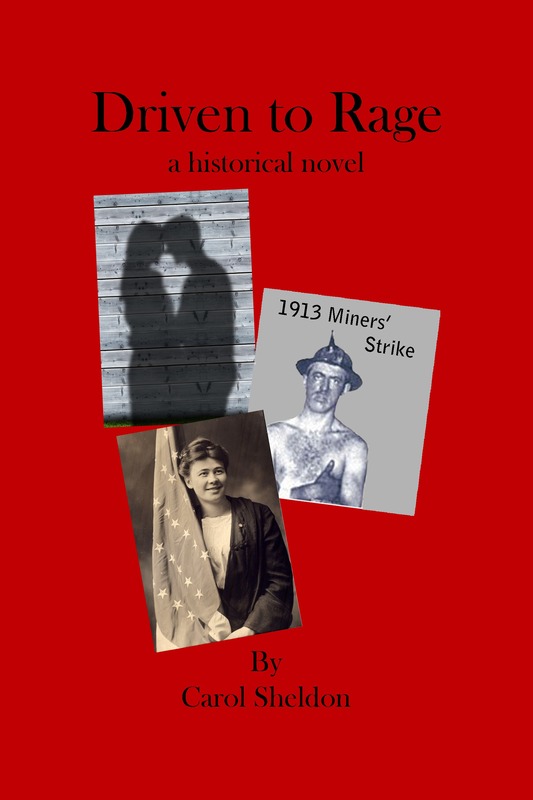 This entry was posted in book readings, Copper, copper mining, Historical Fiction, historical novel, miners' strike. Bookmark the permalink.